It's not how he usually works, notes Ben Lasseter. But on this occasion, the opportunity to bring someone else's exceptional design to fruition made taking a secondary role the right move -- even with the awkward scheduling, unusual access issues and a few tricky alignments. In most of our projects, we do the lion’s share of the work related to our clients’ backyards. We’ll design and build the pool and spa, set up the landscape and take care of all of the components of outdoor living from laying decks to installing outdoor kitchens. We like having that level of control over exterior environments, and our clients seem to appreciate the single-source service we’re able to provide. Every once in a while, however, we’ll come across a project so outstanding that we’re perfectly happy to join a great team, interpret someone else’s plans and carry their design through to completion. That was the case with the dramatic pool and home seen here: They were designed as a unit by the capable crew at A Parallel Architecture as part of a construction process run by Foursquare Builders (both of them Austin, Texas-based firms). We at Design Ecology (also from Austin) had worked with both firms before, although never together on the same project. As a result, we were positioned to serve as something of a bridge as the project began to unfold. Given the involvement of these three Austin firms, it should come as no surprise that the property we worked on was also situated in Texas’ capital city. Construction started on the house a good year before we began with the pool, which made scheduling sense but, as we’ll see below, complicated things for us logistically. The architects set the shape of the pool as part of their original design, so our creative input was limited to devising the hydraulic and automation/control systems. Even here, we were not entirely on our own: In fact, system development required an unusual level of interaction between us and the home builder because the house and pool shared a major structural wall – meaning every shell penetration was scrutinized and waterproofing became an even more critical process because the home builder was as interested and involved in its success as we were. Beyond that, there were several features on the pool that tied directly into details of the house, largely through the brick treatments around the spa and sun deck. Operating separately and on different schedules, we and the home builder had to work things out in such a way that the level and pattern of our brickwork would come together in perfect visual alignment with theirs as it flowed from our deck to envelop the home’s lower level. We did our work first, laying out the pool and making sure we set our levels to intersect with a wall that wasn’t even there yet – always a fun and tricky proposition. Making the match even more important was the fact that the homeowner had played a strong role in material selection, so where details of the design were the architects’ doing, it was more than likely the homeowner would be attentive to how this particular brick treatment came together. The client also selected the tile for the face of the vanishing-edge wall and had it delivered to us directly on site. That’s not the way we usually operate, but in this case the choice was a good one, with the texture of the tile adding nicely to the visual appeal of the flow down the outer face of the wall. On the technical side, we didn’t even need to develop our usual Sketchup/AutoCAD documents: The architects gave us a complete set, and all we had to do was create a set of construction and shop drawings related to the abovementioned hydraulic and control systems. Even if it had been desirable (which it wasn’t), moving the pool or playing with details was simply impossible. It’s fair to say we were passengers on this train as far as the design itself was concerned. But it’s also true that we found our fun on the construction side – and in the fact that, after construction started, we were awarded the landscape design/build contract and would ultimately be able to contribute to the project’s overall look on a more artistic level. 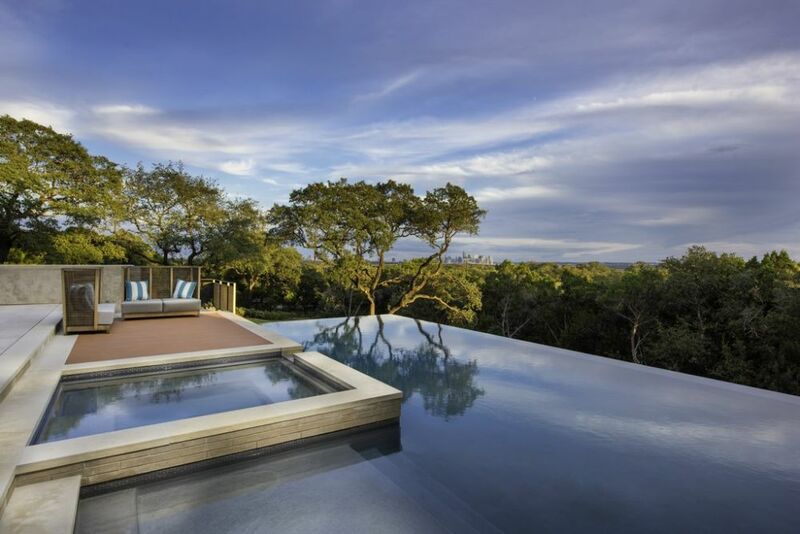 The architect had already designed the driveway and the home’s entry, but we took it from there, working closely with the owner and the architect’s staff to devise an elegant landscape that highlighted the features of the pool and home while taking nothing away from the site’s magnificent views of downtown Austin. In fact, the footprint of the house and pool had been driven by those views: The architects loved the idea of looking across the water from inside the home’s lower level, which is why we had to install a massive concrete footing beneath the pool to raise it up several feet to the optimal level. By the time we began our work on site a year into the project, the home’s foundation was in place and the framers had already started working on the top level of the house. As was mentioned above, this wasn’t great for us logistically, because it meant our access was limited to moving along the side of the house and then working upslope from the base of the pool rather than simply passing through the house. But we did what we had to do, with only a restrained bit of grumbling as we waited quite a while for steps up to the pool level to be built. Our first task was waterproofing the common foundation/pool wall – as suggested above, a critical and thoroughly considered step. We then started forming the eight-foot-tall footers, which wasn’t much fun working overhead and up the slope atop a base of solid rock. In fact, there was no soil at all to speak of, so we ended up needing to hammer out keys for the footings from a huge limestone outcropping. Few builders enjoy this process, but we were actually happy with the thought that our utterly massive structure would be resting on such solid support. How massive? Well, there were three big shoots in all, the first involving application of 60 cubic yards of concrete for the footers; the second adding 62 yards of gunite for the edge basin and part of the vanishing-edge wall; and the third wrapping things up with 68 more yards of gunite for the main pool and spa. These shell-related procedures alone took almost five months to complete – and then we mostly pulled off the project for the next eight months, coming on site only occasionally to work with the builder on deck details and drainage as well as some additional waterproofing. We came back on in force only as the home was nearing completion, tackling masonry and finishes related to the pool and starting our work on the landscape. These late project steps were our most intensive and extended on site. We installed the pool deck using a material called Leuders limestone, quarried locally and prized for its density and uniform color. We then placed the waterline tile, a dark-grey glass product from Daltile (Dallas), as well as the sun deck adjacent to the spa, which was made using a composite-wood material selected by the architect and homeowner. The brick mentioned above came to us directly from the builder: We’d had them order the material we’d need at the same time they placed their original order to make certain there would be no lot-to-lot variations or mismatches with this crucial detail. (We also upped the brick order to allow us to build an outdoor kitchen – designed but not yet installed.) The pool interior is Luna Quartz in “Bermuda,” a lovely royal blue/black-tinged material from Wet Edge Technologies (Mesa, Ariz.). We then set up the equipment room in a void under part of the pool deck – a space dedicated to all of the usual mechanicals related to the house as well as the pool. The main electrical panel and the air-conditioning units, for instance, are right there alongside the pool and spa equipment – with plenty of room left for easy access and servicing. Given the start-and-stop nature of the process for us at Design Ecology, it worked out that my business partner, Scott Cummings, was project lead in the design phase, taking care of hydraulics and the shop drawings as well as coordination with the architects. Once construction began, I took over with the assistance of Todd Jenkins, our senior project manager. In all, we rallied more than 50 professionals to get things done, including our own staff as well as concrete, plumbing and masonry contractors and a landscape crew. It helped that we’re accustomed to technically challenging projects, from cantilevered pools to knife-edge perimeter overflows: Indeed, this one was well within our wheelhouse, and our sole point of trial had to do with that fact that, robbed of access through the home, we had to hoist material up from down the slope for quite a while. Believe me, morale rebounded quickly when the exterior stairway finally appeared! In all, our part of the construction process took the best part of three years – from May 2014 through March 2017, including the landscape work – and was mostly smooth going throughout. The intermittent waiting game and our lack of a consistent presence on site had its drawbacks with respect to focus and energy, but the integration of so many details between our work and the efforts of the home builder kept us all on our toes. Perfection was, after all, the objective! The architect was particularly adamant about matching lines and materials, especially related to the key brick detail that was to provide a strong visual link between the home and the poolscape. We spent hours checking and double checking and, in one minor case, ended up having to rebuild a section of a small wall to satisfy the folks at A Parallel Architecture. Ultimately, these minor (but important!) interactions made all the difference in achieving the desired aesthetics and proved to be well worth the investment of time. With all collaborative projects of this nature, you learn the value of communication, patience and teamwork all over again every time because the dynamics of each team are different. What we all achieved in this case was the product of close, open coordination of the architect, the home builder, us at Design Ecology and a much-engaged homeowner. We all played our parts well, from planning through to completion – and all of us are proud of what we accomplished. As we see it, being asked to participate in projects on this level – a level on which every detail is a component in a work of high architectural ambition – says something about how far the pool industry has come and the potential there is for further advances along these lines. As mentioned at the outset, we enjoy projects where we’re on our own and have complete control, but to spend with a team like this one? We already had great relationships going before we started, and the best outcome for all of us is that we’re already working on other projects together with even earlier communication and greater (and now familiar) collaboration. I can’t imagine a better outcome.